Nanotechnology is a field of applied science, focused on the design, synthesis, characterization and application of materials and devices on the nanoscale. During the last twenty years, scientists have been looking towards nanotechnology for the answer to problems in medicine, computer science, ecology and even sports. In particular, new and improved techniques for pollution control are emerging as nanoparticles push the limits and capabilities of technology. Environmental remediation includes the degradation, sequestration, or other related approaches that result in reduced risks to human and environmental receptors posed by chemical and radiological contaminants. The benefits which arise from the application of nanomaterials for remediation include faster cleanup of wastes. However, cost-effective remediation techniques pose a major challenge in the development of adequate remediation methods that protect the environment. 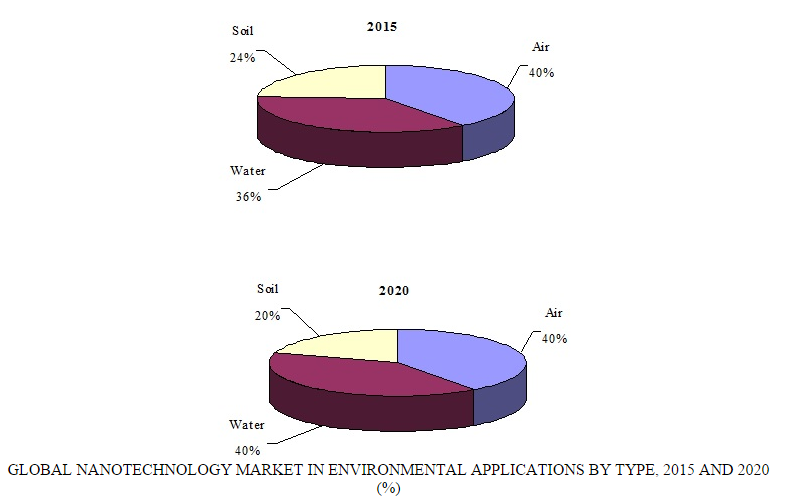 According to BCC Research’s Nanotechnology in Environmental Applications: The Global Market (NAN039C), the overall market for nanotechnology in environmental applications is expected to reach $25.7 billion in 2015. This market is projected to grow to $41.8 billion by 2020, at a significant five-year CAGR of 10.2%. Among nanotechnology’s many applications that have environmental implications, remediation of contaminated groundwater using nanoparticles containing zero-valent iron is one of the most prominent examples of a rapidly emerging technology with considerable potential benefits. However, there are many uncertainties regarding the fundamental features of this technology, which have made it difficult to engineer applications for optimal performance or to assess the risk to human or ecological health. Nanotechnology is playing a significant role in pollution prevention technologies by minimizing quantities and exposure of hazardous wastes to the air and also by providing maintenance and enhancement. A groundswell of global support for developing nanotechnology as a pollution remediation technique will continue for the foreseeable future. “As nanoparticles push the limits and capabilities of technology, new and better techniques for pollution control are emerging,” says BCC Research analyst Aneesh Kumar. “The market share of air and water remediation is expected to lead growth, due to their cost effectiveness. One of the most popular applications of nanotechnology is the use of nano compounds, devices and tools for air remediation. Nanotechnology is being incorporated and improvised in in situ conditions for detecting air contaminants, as well as cleaning, maintaining and enhancing air quality. Air filtration techniques are similar to water purification methods, and find applications in buildings to purify indoor air volumes. Nano filters could be applied to automobile tailpipes and factory smokestacks to separate out contaminants and prevent them from entering the atmosphere. In addition, nanosensors have been developed to sense toxic gas leaks at extremely low concentrations. Overall, there is a multitude of promising environmental applications for nanotechnology, with the main focus area on energy and water technologies. The nanotechnology market for air remediation applications accounted for nearly $9.4 billion in 2014. During the five-year period of 2015 through 2020, this market segment is forecast to further grow at a CAGR of 10.3%, to reach $16.7 billion in 2020. Overconsumption and contamination of freshwater sources is leading to their scarcity in all regions of the world. As with air pollution, harmful pollutants in water can be converted into harmless chemicals through chemical reactions. The majority of the world’s water supply has too much salt content for human consumption. Desalination of seawater is an expensive solution to create new sources of drinking water, although carbon nanotube membranes have the potential to reduce desalination costs. Similarly, nano filters could be used to remediate groundwater or surface water polluted with chemicals and hazardous substances, while nanosensors are being developed to detect waterborne contaminants. The nanotechnology market for water remediation applications totaled nearly $8.2 billion in 2014, and is expected to grow at a CAGR of 12.4% to reach $16.6 billion in 2020. Nanotechnology is being incorporated to extract or purify substances of significant concern in soils, sediment, and groundwater including heavy metals (e.g., mercury, lead, cadmium) and organic compounds (e.g., benzene, chlorinated solvents, creosote, and toluene). Specific control and design of materials at the molecular level may instruct increased affinity, ability, and selectivity for pollutants. Soil remediation applications accounted for nearly $5.9 billion in 2014 and will grow at a CAGR of 6.4% to reach $8.4 billion in 2020.